Dr. Joseph Castleberry, Northwest University’s president, announced in an email to students that classes will resume Thursday, Feb. 14, on a delayed-start schedule. In the meantime, efforts to clear snow and ice from campus roads and walkways continue. Announcements regarding future schedules will continue to go out through email, campus-wide NU Alerts text-message system, as well as notices on the Eagle homepage. All members of the NU community are encouraged to be cautious and safe while commuting and walking to classes in the coming days. 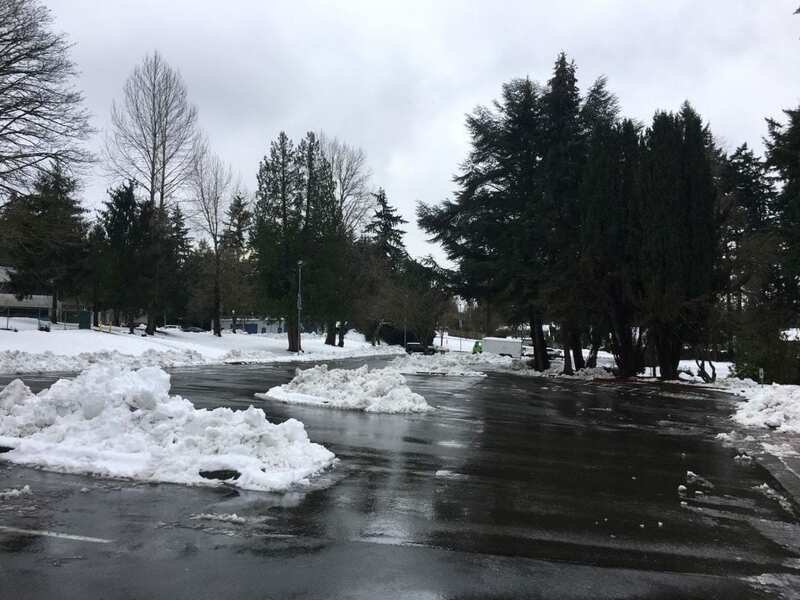 The National Weather Service continues to warn western Washington residents to be careful of weather hazards including snowmelt flooding and hazardous travel, especially on secondary streets and side streets where snow melt and forecasted low temperatures may cause dangerous conditions. Some students commuting from higher elevations may also continue to see snow during their drives to campus. But getting to and out of campus remained hazardous through midweek. A backhoe worked to clear the parking lots and the entrances to campus. At least one car slid down Northeast 53rd Street and hit a sign at the intersection of 53rd and 111th Avenue Northeast, as of Wednesday afternoon. Caution tape marked off the edge of Millard Hall’s west-facing facade, due to continued slippery conditions. Campus Security also assisted numerous vehicles trapped in slushy road conditions throughout campus. Castleberry said in his email that record-breaking weather over the past ten days has proven that the region is unaccustomed to handling large amounts of snow and that changes must be made in the future. Students can expect faculty to be in contact with them regarding ways to stay on track academically despite missed classes, as administration works on plans to avoid this problem in the future, Castleberry said. Some professors have already arranged Skype or Zoom-delivered lectures, out-of-class projects and assignments, or have made arrangements to cut extra material as needed to make up for lost time. Castleberry voiced his apologies to everyone involved for any inconvenience due to the snow closures and thanked staff and student-workers who have worked overtime to keep campus life functioning as best as possible. “We are grateful to all of them for their hard work and to everyone on campus for their patience,” Castleberry said. Please check back to The Talon’s homepage and social-media accounts for further updates on weather affecting campus.